The Canfield Connector TMLT is an ultra-compact all solid state time delay relay incorporated into a vibration and environment resistant composite encapsulant housing. The heart of the timer is a powerful microprocessor that is made in quantity then programmed to become the timer type according to customer specification. Featuring 6 timer modes of operation with two voltage ranges; 12-240V AC/DC or 12-60 VDC and four output options; Sinking ON First, Sinking OFF First, Sourcing ON First, and Sourcing OFF First, and 13 time ranges, from 0.1 to 2000 seconds. The timer is available with screwdriver or hand adjustment, and troubleshooting is a breeze with the on board indicator light. The TMLT is versatile as well as rugged, and each timer is 100% tested, made in America and resistant to dust, vibration and humidity. Mounting is accomplished by use of a through hole able to accommodate up to a 1/4″ (6mm) screw or by use of a DIN rail mount adapter plate. Electrical connections are .250″ AMP Faston posts for crimp type push-on connectors. 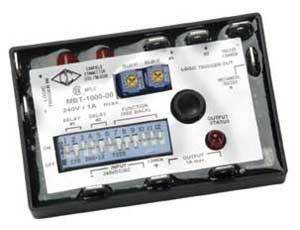 The Canfield Connector model MBT Multifunction Block Timer is designed as a full featured multiple mode of operation, multiple voltage, all-in-one timer. The unit is offered in a small epoxy encapsulated housing with on board mode switches and adjustments. The unit has a time range adjustable from 0.1 seconds to 33.3 hours. Features include twelve modes of operation including a multitude of logic function possibilities and an indicator light for fast troubleshooting. The unit can be used to trigger another MBT in a cascade type arrangement, to meet complex functions or longer time ranges. With a voltage range of 12-240 VDC / 24-240 VAC 50/60 Hz, the MBT can instantly handle all mobile, industrial and automation applications right off the shelf. Each timer is 100% tested for function and quality and is resistant to dust, vibration and humidity. Mounting is accomplished by use of a through hole able to accommodate up to a 6mm diameter screw. Electrical connections are .250″ AMP Fasten posts for crimp type push-on connectors.